Nerv Impulse: Grey Knights... and another knight. 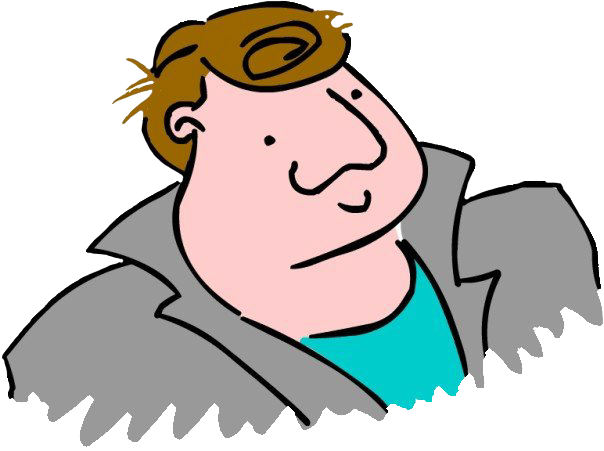 A named character! In such a small number of points! I know, I know. But He's plastic. And he looks like latter day Sean Connery. And he has a big hammer for bopping folks on the head. Man I love this model because it is so stupid. I love it even more now there are primaris marines out there which actually look designed for fighting. This is blatantly a powered suit for moving heavy boxes or some other manual labour. But no, we gonna give it a sword and a giant flamethrower and use it to hunt demons the size of tanks. The guy is strapped to the outside. By what looks like a rollercoaster harness. He hasn't even got his hat on. Since it's more important to shout really loud. 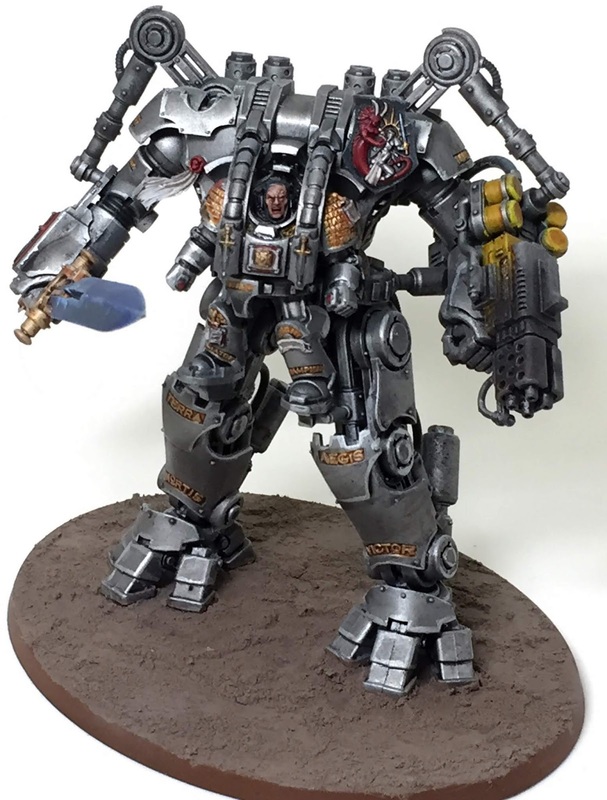 Grey Knights have really become a lot cooler to me since they sort of became this awkward middle child. Came along too late to have any awesome relics from the golden age of technology, but too soon to get any of the new Primaris hotness. So they get what is blatantly repurposed civil construction equipment - but not before sticking a tilt shield on with a little fresco. Paint wise all this stuff is really simple. Mostly it's silver and mostly the silver comes out of a can. Used some weathering powder on the flamethrower though. Which I think looks rather good. The base is "Agrellan Badland" and on the infantry it's "Agrellan Earth". Which is supposed to look like some sort of blasted desert stuff without you doing anything to it. With the Badland being a bit chunky for large models. It's solidly... okay. And five 'standard' Grey Knight Terminators. I actually had these guys painted for a long time because my original plan was to do a squad of these led by an Inquisitor. However when the Grey Knight codex came out I decided to modify my plan and go for a pure Grey Knights force. They have Nemesis Force Halberds, because I am old and that used to be the only option. They have a flamethrower because of how cool flamethrowers are. The sargent is holding the severed head of a bloodletter because that is so stupid because demons disappear into the warp when you kill them but I don't care. Painted these guys a long time ago but I am still very pleased with them. I'm really pleased with how the faces came out in this project. And a random historical knight. This was a freebie from the Warlord Games HQ store in Nottingham. 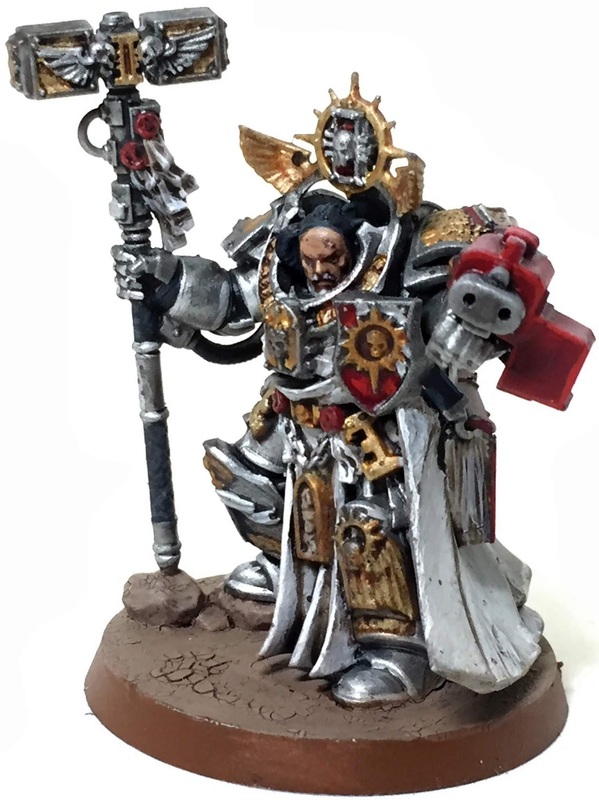 I painted him because I was waiting for the instant desert base stuff to do it's magic on the Grand Master Voldus so I could varnish him, and I had this sitting next to my computer. Thich is why he's painted in the (as it happens super patriotic) colour palette of my Grey Knights. I don't know much about him because I have not yet gotten to the point in life where I enjoy historical wargaming. Take picture on my iphone using a third party camera app that actually has a macro mode. Export from Dropbox back to the iPhone's Camera Roll. This begs two basic questions. Why can't I post images from my Computer to Instagram? But most importantly - why does instagram then make everything square?